Green Giant makes chips. Yes, THAT Green Giant, (unless there are multiple companies with the same name and same ridiculous green man), apparently makes ... chips? What? I never expected to see the giant outside of the canned and frozen veggie aisles! They make two types of chips: roasted veggie tortilla chips and multigrain sweet potato chips, both in several flavors. I guess the veggie focus fits with the rest of their products? I honestly have no recollection of where I got these. I found them in my pantry. I'm sure I didn't seek them out, but can't for the life of me figure out where they came from. Anyway, yes, Green Giant makes snack foods. Who knew? Multigrain Barbecue Sweet Potato Chips. I guess I should have looked at the picture on the front more closely, as I was kinda shocked when I pulled out the first chip. It looked nothing like a regular chip. That crazy green giant, mixing things up! Each chip was either square or rectangular, but then curved (see example chip I'm holding up in front of the bag above). They had a heartiness, and a somewhat interesting texture, I guess due to the "multigrain"-ness of them. The sweet potato flavor was also there. Not greasy at all. A healthy tasting chip, but not in a bad way. That all worked for me, but I didn't really like the barbecue seasoning. I generally like barbecue chips, but in this case, it was just strange with the sweet potato. 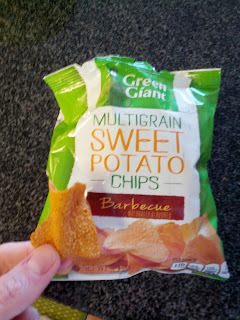 Green Giant also makes the sweet potato chips in basic sea salt, which I'm guessing would be more successful. I passed these off to Ojan, who immediately said he didn't like barbecue chips, but he tried them anyway. And then tried a few more. He laughed, saying he was "pulling a Julie", continuing to eat them just to figure out if he liked them or not. Both of us concluded that they weren't bad, but they also just weren't very good. So we passed them off to another co-worker, who proceeded to do just about the same thing, trying several, just to figure out if he liked them or not. Not being a baseball fan, the name Lefty O'Doul meant nothing to me. But apparently, he was a baseball player, who then opened a bar near Union Square in San Francisco in 1958. The bar is actually still open, and serves breakfast, lunch, and dinner. It sounds like quite the place, with the food served cafeteria style. But what makes it famous, besides the name, and being around for so long, is the cocktails. Apparently Lefty made some mean cocktails. They have capitilized on this, so now, you can even purchase bottles of their mixers, like the the most famous, the Bloody Mary, or Margarita and Sweet and Sour mix. 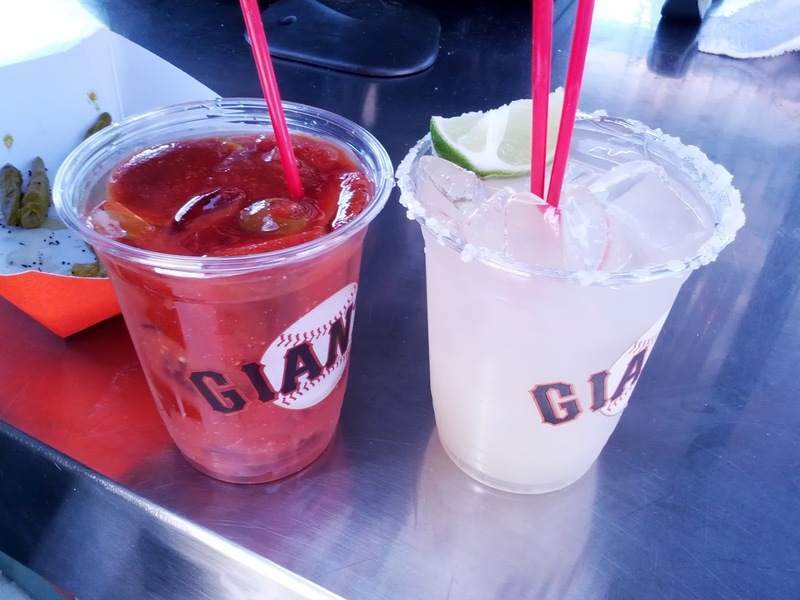 This past year, they also opened a bar at the ballpark. It is just a little stand, and doesn't serve any food, only cocktails. Since Emil is known to like Blood Marys, and actually did know about Lefty O'Doul's, this was of course our first stop when we reached the park. I don't actually care for Bloody Marys, but I figured I had to at least try it. It was ... a Bloody Mary. Tomato-y. Not a ton of spice. No garnishes. I don't have a lot to say about it, except that Emil deemed it decent, and he is pretty hard to please with a cocktail. He noted that it wasn't quite as good as at the full bar, but good enough that he returned several times. Given that they are using the same mix, it makes sense. We were also in the market for margaritas. It turns out, we had many options for margaritas, as pretty much every stand sold them, but since we were at Lefty's already, and they also had their own branded margarita mix, we decided to try it out. It had a well salted rim. Tart lime flavor. Not too sweet. Really, a pretty decent margarita, and the best of the bunch we had that day. Margaritas can be nice on a hot day, so if I were ever back at the park, and it was somehow warm, I'd consider getting another. Note: the margarita from Tres, which I expected to be decent, was not. It was watery and not good at all, barely any salt on the rim. Definitely would not get that one again. Pizza Hut is one of those places that pretty much everyone in America has been to. Does anyone think it is very good? Nah. But, inevitably, you wound up eating the pizza at some point in life. For me, it was when I was in elementary school, and they sponsored the BookIt program. I don't remember the details exactly, but you read books, collected stars in the form of stickers that went on a pin, and somehow that turned into a free personalized pan pizza. I remember never liking pizza hut very much. Even as a child, I thought the crust was just oily and nasty, and that there was too much cheese. I also recall particularly hating their cheese. But, I loved excelling at school, so I collected those stars, and sported my BookIt pin proudly. Anyway. So I hated the pizza, but ... I have a weakness for buffets. I did as a kid, and I do now still. My fondest dining memories as a child were of the Ponderosa buffet ... that thing was epic! I loved it. While it didn't compare with Ponderosa, Pizza Hut in my town also offered a buffet, with different types of pizza, salad, and pasta. Sure, I didn't like their pizza, but I couldn't resist a buffet. I got to try so many things in one sitting! But, the real draw however was the dessert pizza. It came in several fruit flavors (apple and cherry? ), with a crumble and icing on top. I'd suffer through the crappy pizza just to get that dessert pizza! 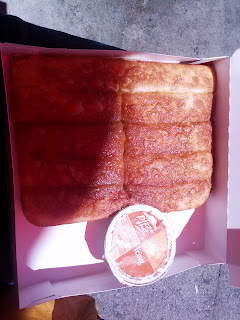 So this year, while on my little quest to redeem my free birthday goodies, I saw Pizza Hut. I thought nothing of it, until I saw there was a dessert option. It wasn't the dessert pizza, but instead, cinnamon sticks with icing (I could also pick breadsticks with marinara, but who does that?) I figured that even if I didn't like it, Ojan loves cinnamon sticks/rolls/bread, so he might appreciate it. So, I headed to the nearest Pizza Hut to see what it was all about. Ordering was easy, all online, even for my freebie. The staff was really quite friendly, even though the location had only 2 stars on Yelp! I was even wished a happy birthday. Baked Cinnamon Sticks with Icing. $5. The cinnamon sticks come in two sizes, a "single order" or a "double order". I had no idea how many to expect with either size, but went for the small "single order". I was a little surprised when the box that was handed to me was the size as that of a personal pan pizza. It turns out, a single order is 10 sticks! The cinnamon sticks were piping hot, fresh out of the oven. They were slightly crispy on the outside. They seemed to be just be regular pizza dough, topped with tons of butter, cinnamon, and sugar, about what you'd expect. The middle sticks had the most generous coating, but they were all pretty decently coated. They did not skimp on the cinnamon and sugar! There was so much cinnamon and sugar that you didn't actually need the dipping sauce, which was icing. It was just super sweet. But, it melted onto the hot cinnamon sticks soooo well. Dipping them in was a bit annoying, but spreading it on top instead worked very well. Overall, these actually looked, and smelt, really good. Well cooked, nicely coated, tons of topping. But ... meh. The pizza dough just didn't do it for me, and they were too heavy feeling. Ojan, who loves cinnamon rolls, cinnamon bread, etc really enjoyed them. But I wouldn't get them again, besides just to bring back for him. $5 for 10 sticks seems like a fine price, but it seems like offering a smaller serving would make more sense. I can't imagine anyone getting through a box of these after having pizza too. If you are a heavy icing user, extra icing is available for $0.35. It has been a while since I've found a new local chocolate maker. For a while, it seemed like there was a new one to try every week, but I finally thought I'd exhausted the supply of local chocolatiers. 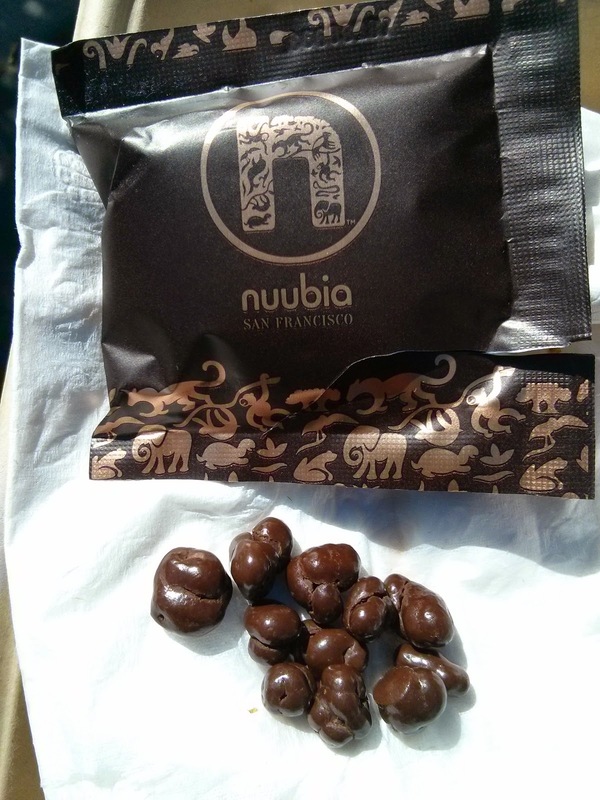 And then I found Nuubia, a recent addition to the local chocolate scene, based in Pleasanton, founded in 2011. The main chef has won numerous awards over his career, and was even the "Executive Chocolate Chef" for the Wynn group in Vegas. I had no idea that chocolate chefs existed! They also care a lot about the environment, using GMO-free ingredients, but also donating 15% of their revenue to conservation efforts in the areas where they source the chocolate. I only tried a few pieces, but would like to try more. 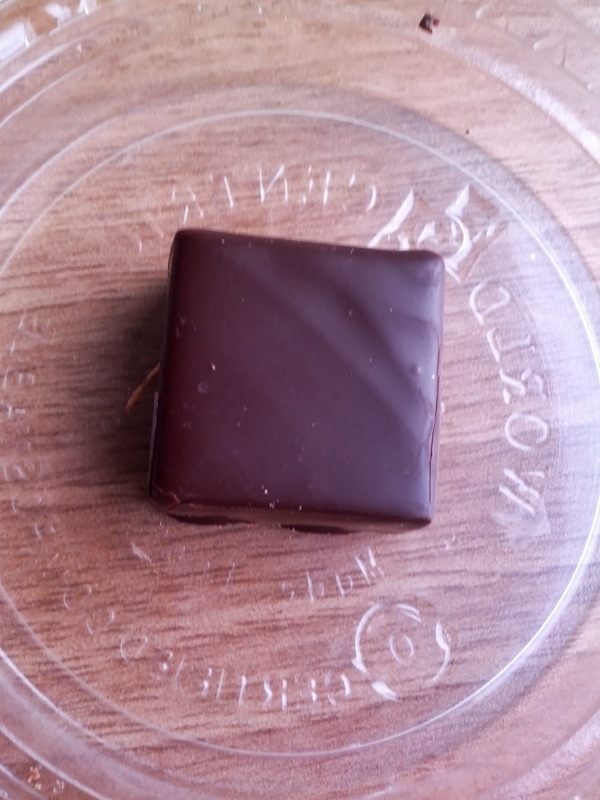 "70% dark chocolate silken ganache covered with rich dark chocolate couverture." Wow, they weren't joking with the "silken ganache" description. This was incredibly, incredibly creamy, or, I guess, silky. Covered in a thin dark chocolate shell. It was decent chocolate, but I didn't really detect much subtlety or complexity to it. But so very smooth. "Caramelized rice crispies drenched in rich dark chocolate with a shot of espresso." These were quite tasty. Sorta like a cross between a chocolate covered espresso bean and rice crispies? I loved the crunch. 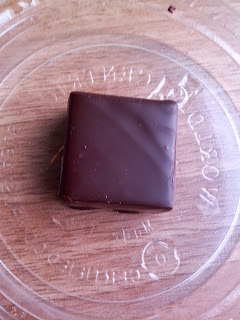 The dark chocolate was high quality and deeply bitter. The bitter was accented by the intense espresso flavor. 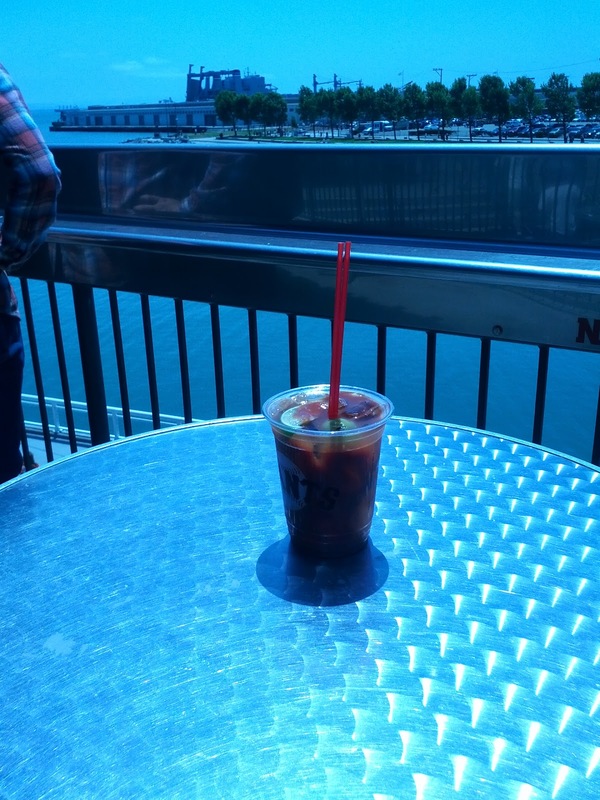 This was perhaps the first time in my life where I've really understood why anyone would want "mocha" flavor. The chocolate and espresso were a great combo! These were delightful by the handful along with my cup of coffee, but I could imagine being really awesome sprinkled on top of ice cream too.